Mexico has not experienced a huge emigration of Italians (like Argentina or the USA, for example), but academics like Benigno Zilli (http://revistas.uv.mx/index.php/ulua/article/download/1840/pdf_258) calculate that in 2017 nearly one percent of the 123 millions of Mexicans are in some way -directly or remotely- descendants of Italians going back to colonial times. Thalia Sodi (Mexican singer, songwriter and actress), who is one of the most successful and influential Mexican singers worldwide, has distant Italian roots. For example, the famous Mexican actress/singer Thalia Sodi is considered a fully Mexican citizen, but her family name is from Italy because her father had a "nonno" (grandfather) born in Firenze (Tuscany) who emigrated to Mexico in the early 1800s. However many of the actual Italo-mexicans have their "roots" in those who settled from Italy in the XIX century farm "colonias", promoted by the Mexican government in the 1880s. And until 2008 there were little communities in some of these former Mexico's "colonias", where was still spoken the Italian language & dialects: Chipilo, Zentla, Ciudad de Maiz and La Aldana in the capital area (https://books.google.it/books?id=T9QI5HFWiIkC&pg=PT15&lpg=PT15&dq=italiani+di+zentla&source=bl&ots=Bc9Nd214YL&sig=qjoqd4tAkj-bFPPxpm__g2il7sI&hl=it&sa=X&ei=xylcT6WqC_SFsAKLkYGxDQ&ved=0CCgQ6AEwATgK#v=onepage&q=italiani%20di%20zentla&f=false). Indeed in 19th century Mexico, there were several colonization projects, although in the last two decades of this century, these projects involved federal government's establishing national or foreign population nuclei with agricultural settlers. The objectives and policies of this process can be understood by examining the case of the agricultural colonies of Italians established between 1881 and 1882, an issue that has not been studied very well. Colonization with European people in Mexico was promoted from the beginning of independent life in the country, although the most concrete results were observed in the last two decades of the nineteenth century. The historiography has described the government of Porfirio Diaz (president of Mexico) as the trigger period of these projects. However, it should be noted that the main federal colonization company, at least numerically speaking, took place between 1881 and 1882, during the government regime of Manuel González. In the cabinet of González he served as Minister of Development Carlos Pacheco, who organized the establishment of agricultural colonies. By the end of the 19th century, immigrants of Latin origin, such as the Spaniards, Italians and French, were the most suitable because they were more adaptable to Mexican culture and conditions. The need to promote colonization with foreigners, mainly Europeans, arises from the conception that throughout the nineteenth century was built (in the Mexican & Latinoamerican society it was called "blanqueamiento" -meaning: "whitening"- of the country's population) around the superiority of the European race with respect to the indigenous race. Indeed in the first half of the nineteenth century colonization projects were not feasible in Mexico because of the economic shortages suffered by the country, so during this period only colonies of French established in Veracruz (the first in Coatzacoalcos in 1831) stood out and the second in Jicaltepec in 1833), that finally constituted a failure due, among other things, to bad weather in the area and to unhealthiness. Also in the 1850s an Italian model colony was established in Papantla, Veracruz, where "on the other hand, the point at which it had been destined for it became ill and all the colonists who left their fields and moved to a immediate town. " For the second half of the nineteenth century in Mexico, laws were enacted regarding colonization, such as the provision made by Antonio López de Santa Anna on April 22, 1853, with which the public administration was modified and the Ministry of Public Works was created. Colonization, Industry and Commerce. Likewise, on March 28, 1865, the empire of Maximilian decreed the creation of a colonization board with the following functions: "to study, and propose bills and regulations, regarding colonization, free and at the expense of the immigrants [...] and with regard to the discovery, demarcation and distribution of vacant land ". The main objective was to increase the population with foreign immigrants. At the end of the 19th century, many immigrant groups entered the country covered by colonization policies although these did not necessarily correspond to the expectations of federal agricultural colonization projects, as many foreign groups were characterized by emigrating to Mexico due to other reasons, under particular projects and sponsorships or migratory chains. It highlights the immigration of Spaniards, Catalans and Lebanese from 1880, " Cubans between 1868 and 1898, colonies of Mormons established in Chihuahua in 1886, Chinese in Baja California, Jamaicans in Campeche, Angloamericans, Swedes, Norwegians and Germans from Colnett Colony in 1886 and Guatemalans in Chiapas. In the 1890s and the first decades of the 20th century other examples can be identified, such as the Mennonites, in 1922, the immigration of Greeks to Culiacán and the great exodus of Spaniards exiled during the Spanish Civil War. Among these examples stands out the Italian immigration registered between 1881 and 1882, which is considered as the main project of federal agricultural colonization because in just two years it was possible to bring to the country an approximate number of 2,500 Italians destined to become agricultural settlers. On the one hand, numerically speaking, it was the most important project of the late nineteenth century that occurred in a very short period and, on the other, it was possible to install them in six agricultural colonies that complied with the logistics, policies and governmental expectations of nineteenth-century colonization projects. Even the contemporary press described the project as the "only one that has recently begun under better auspices." The good success of the company, first of all, is to the peace that our republic currently enjoys. Another important characteristic of the Italians who arrived in Mexico in those years was that they were individuals whose peasant origin had been selected to develop the social function of agricultural settlers in accordance with the expectations of the Mexican government as stipulated in the contracts of colonization and immigration of the time. The characteristics of the establishment of the Italian colonies will be explained below to illustrate the colonizing process. As part of the colonization policy, the Mexican government made advertisements in Europe through advertisements in parishes, street signs, press releases and immigration agencies. All this to convince the Italians to move to the country and form agricultural colonies. The immigration companies used agents as intermediaries between them and the population. The immigration agents, who could also work on their own, operated in places with a migratory tradition, went to the bars and fairs and gave speeches to promote the advantages of emigration and the offers made by the companies. They also used colorful pamphlets and posters and published advertisements in newspapers of the time. The publicity that Mexico used in 1881, especially in the press, had the peculiarity of being endorsed by the Italian government and public opinion. The propaganda about the colonization programs began approximately two months before the date set for the embarkation of the emigrants (at the end of August). During all that time the newspaper notes emphasized the advantages of the trip and, above all, stressed that because it was an agreement made with the Mexican government, the trip and the colonization company were safe. First, the newspaper disclosed the characteristics of the country. For example: Although all kinds of fruits occur in these [tropical] zones, it is not here that the European settler should be established, because the hot and humid temperature does not correspond to his temperament. But the temperate lands are described as a true paradise because in them reigns a continuous spring sweetness. In another part of the text the following was expressed: "The Mexican people are aware that the era of the revolution is over; a strong government guides the destinies of the country; material well-being, agriculture and trade have already made great progress; peace and tranquility reign - as President Manuel González declared at the opening of the last congress - to the last corner of the country". In addition, the newspaper published the announcement of the colonization that contained the conditions of boarding, the price of the passage, the characteristics of the ship and the shipping company. In the case of Mexico, Il Raccoglitore broadcast a kind of sign or poster a month before and for ten days in a row that indicated: "Colonizzazione al Messico. Sotto la Sorveglianza del governo Messicano. Linea Livorno - Veracruz. Il vapore di I classe di bandera nazionale 'Atlantico' [...] armatori Dufour and Bruzzo [...] will start on the 31st of August. [...] Prezzi di passagio: II class L. 1000, II class L. 900, III class L. 275. Prezzi ridotto per gli agricoltori che partono pel Messico colle condizioni dalla circolare March 28, 1881 della societá concessionaria G. Rovatti y Cía. Di Livorno; L. 85 fine agli anni 11; L. 42.50 dagli anni 11 ai 2; al di sotto uno gratis per famiglia." The announcement emphasized that the colonization of Mexico would be under the supervision of the Mexican government. Thus, immigration to Mexico, to Brazil or to any place that was promoted directly by the receiving government was well regarded, unlike the propaganda made by clandestine agents or independent agencies. The rural exodus to Mexico in 1881 was possible, among other things, because Italy received positively the propaganda of Mexican colonization. As a result of the promotions, in 1881 the first contract was signed between the Mexican government and the Italian immigration house Rovatti y Cía. This company undertook to "dispatch from the Upper Italy to Veracruz a number of 150 families of expert and hardworking farmers from Upper Italy and the Trentino not exceeding 500 people from two years old onwards". For its part, the Mexican government was obliged to "pay the company Rovatti y Cia or its attorney 75 Mexican pesos for any person over twelve years and 37.50 Mexican pesos for any person under this age and older than two years" . As a result of this agreement, in 1881 the first expedition of Italians left Genoa. The second contract with Rovatti y Cía., In December 1881, established the expedition of at least 800 immigrants. Again the Mexican government was forced to pay 65 Mexican pesos per person for those over twelve years and 32 for those under twelve and over two years. From these agreements, the Italians arrived in Veracruz on three different trips, were taken to the interior of the republic and formed agricultural colonies in the states of Morelos, Puebla, Veracruz, Federal District and San Luis Potosí. So, the Mexican government created six agricultural colonies: "Colonia Manuel González", "Colonia Porfirio Díaz", "Colonia La Aldana", "Colonia Diez Gutiérrez" (Ciudad del Maíz), "Colonia Carlos Pacheco" and Chipilo's "Colonia Fernández Leal". Of all these, the only one that remains solid (with its customs and language called "Chipileno") to this day is the one in Chipilo. The other settlers disbanded, mixed and lost their language, customs and other distinctive features. Colonia Manuel González. The first of these was established in 1881 at the El Refugio ranch, jurisdiction of Huatusco, in the state of Veracruz. Later, the director of the colony sought to expand it by acquiring the land of the ranch of Socapa, in Huatusco, property of Florencio Suarez. The colony was named "Manuel González" and was formed, approximately, by 428 Italians, as indicated by a telegram received in Veracruz on October 19, 1881: "The Atlantic steam carries 428 people that make up 88 families -45 Trentino families, 19 Lombardia and 24 of the Veneto. " Particularly in this colony, the Italians received lots with an approximate area of ​​ten hectares spread over three different zones, first, second and third quality of the land. Each head of the family signed an individual contract with the federal government. With this document, they not only acquired material goods, obligations and rights, but the foreigner also acquired a new status that in turn gave him a new identity, that is, he would be considered from that moment on as a "settler". which was based mainly on the possession of a small individual property and the obligation to populate a territory. Presumably this type of individual contracts were signed with the foreigners of each of the colonies, since all of them received the same prerogatives at the time and were constituted in similar circumstances and under the same model. Colonia Porfirio Díaz. The "Porfirio Díaz" colony was another community of Italians that as part of the same colonization project was established in the haciendas of Barreto and San Rafael Temilpa, municipality of Tlaltizapán, district of Cuernavaca in the state of Morelos. The Mexican government bought both haciendas to establish the future colony. The first had a cost of 19,000 pesos with an extension of 2 031 hectares 4 515 square meters. While the second, the Temilpa ranch, it cost 16,000 pesos and its surface measured 10,941 hectares and 7,200 square meters. This included all its annexed ranches: Temilpa, Estacas, San Vicente, El Meco, Chinameca, San Pablo, Atenanquillo and Los Dormidos. Although both haciendas were purchased for the purpose of "colonization," it should be noted that in the large area formed by the two properties, only one colony was located, probably due to the lack of continuity in the colonization project, which demonstrates the failure of the first tests. Colonia Carlos Pacheco.In the state of Puebla, two more colonies were installed. They were named "Carlos Pacheco" and "Fernández Leal". The first was established in the district of Tlatlauquitepec and the second in Cholula, with 424 individuals. The Carlos Pacheco colony was founded in 1882 on the lands of the Hacienda de Mazatepec and the fraction of the town of Tételes. The hacienda was purchased from the testamentary of Mr. José Joaquín Vargas at a price of 12,000 pesos, while the property acquired in Tételes cost 5420 pesos and had an area of ​​2000000 square yards. Unlike its homologues, this community was composed of families that at one time were part of the other colonies. When arriving at their destination, the immigrants received free transportation, animals and farm tools, an effective daily of 25 cents for each older person and twelve for minors, for two years; however, the amount corresponding to these inputs must be reintegrated within a period not exceeding ten years. Finally, each head of the family was given an amount of five hectares of labor and, free of charge, a plot for the construction of the house. When the Italians began to emigrate from the colony, Mexican settlers were allowed to sell the land at fifteen pesos per hectare of labor and at fifteen pesos a lot to build their room. For the Mexican heads of family, ministrations and free transportation were suspended. Colonia La Aldana.The "Aldana" colony was the smallest in number of inhabitants. It was founded in 1883 in the Hacienda de la Ascensión and land of the School of Agriculture, municipality of Azcapotzalco, in the Federal District. It was a very small group because it was established on the school grounds but it was decided so that the students could learn labor disciplines, crops and foreign agricultural techniques. Between 1880 and 1895, the National School of Agriculture passed from the Ministry of Public Instruction to depend on the Ministry of Development, it is clear that Carlos Pacheco, minister of development and in charge of regulating colonization, decided to install the colony near the "Campus" as strategy to develop a complementary project between colonization and agricultural instruction. Colonia Diez Gutiérrez.Finally, the colony of San Luis Potosí or "Diez Gutiérrez" was established in 1882, twelve leagues from Ciudad del Maíz, head of the party that had the same name at that time. 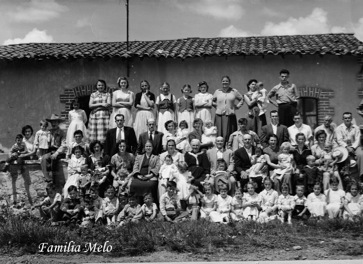 It was installed with approximately 87 Italian families on lands of the Ojo de León ranch that were owned by the Arguinzóniz family, whose members were part of the state's political class. This was a colony anchored in an isolated place and seemed to become hermetic; however, as has been demonstrated, through historiography on immigration, it was part of a very broad colonization project promoted and developed by the government, planned over time and with analogous communities, including in South America. Additionally we must remember that there were other "Colonias italianas" in Mexico created by private emigrants without government support, like the one in Monterrey (see above photo) and in "Nueva Italia" and "Lombardia" (both created in Michoacán by Dante Cusi, an Italian entrepreneur). Indeed in 1909 an Italian immigrant to Mexico named Don Dante Cusi (from Brescia in northern Italy) founded the town of 'Nueva Italia' (“New Italy”) in the state of Michoacan as a colony for Italian immigrants. Nueva Italia was an early success, developing the largest irrigation system in all of Latin America and becoming the leading producer of cotton, rice, melon and maize in Mexico. Dante Cusi also founded nearby the town of 'Lombardia', which is today the seat of government of the municipality of Gabriel Zamora also in the state of Michoacan. Many of the Italian immigrants to these communities in Mexico came from northern Italy, mainly during the traumatic years of Italy's unification. Later Italian immigrants to Mexico in the late 19th and 20th Centuries would be more from the south. Most settled in central Mexico and in coastal areas. Some of the first groups came during the short-lived second Mexican Empire of Emperor Maximilian who had previously been the last Austrian Viceroy of Lombardy-Venetia. Things were often difficult for the first to settle, but over time they prospered and today Italo-Mexicans enjoy a very high status in Mexican society. Despite the existence of various spontaneous or induced migratory flows, the immigration of Italians to the country is a particular case that clearly illustrates the colonization process of the 19th century because it was a project that fulfilled all the requirements imposed by the government to carry out the company and that discloses the expectations of the Mexican government, the Italian government and the settlers themselves. From the documentation that there is in this respect it is possible to identify how the political elite of the country tried to solve the economic, agrarian and demographic problems when receiving hundreds of foreign families. Colonization with foreigners was not exclusive to Mexico. Different countries of South America (from Argentina to Brasil and others) also established agricultural colonies following similar patterns to each other. Latin American colonization projects seem to be linked because they have the same origin: economic and demographic crises of Europe, the international propaganda of colonization and the liberal and positivist thinking of the political elites.